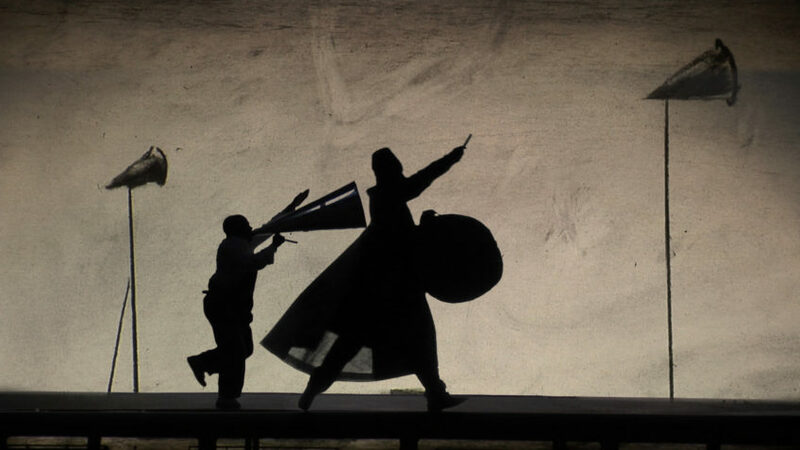 If you were sorry you missed South African artist William Kentridge’s 2010 production of Igor Stravinsky’s short opera “The Nose,” which played at The Metropolitan Opera, you must experience “The Refusal of Time,” a newly acquired art exhibition with moving parts that is easy to label operatic. The Metropolitan Museum of Art co-owns this installation with San Francisco’s Museum of Modern Art. Five video projectors provide a surround of imagery on three walls. Occasionally it seems like the image is the same, like an early projection of metronomes that tick off time and go haywire with their own rhythm. It is easy to trance out if you sit too close to the front wall. A scattering of chairs is secured to the gallery floor at odd angles around the centrally located large perpetual-motion sculpture that Kentridge calls his breathing machine or elephant. The gallery is dimly lit and the videos are black and white. Sitting in any of the 20-some chairs limits full viewing but even standing at the back of the gallery or walking around does not provide complete reception because details often go by quickly. Kentridge, a white man of European Jewish heritage, figures prominently in the videos. He is caught repetitively stepping over the back of a padded chair onto the seat. In another sequence, he is framed by gigantic book pages and is seen staring at himself (or so it seems) as if he were looking into a mirror. In fact, he is just standing at the edge of two different video frames. The original music and soundscape of Philip Miller provides aural depth to the production and enhances one of the last sequences where black players and dancers begin an informal parade on the left wall and progress around the three walls until the entire group one by one disappear. The show with its themes of African culture, time-space continuum, human intelligence and more runs for 30 minutes and is worth seeing several times.